Nikolaus August Otto (14 June 1832, Holzhausen an der Haide, Nassau - 26 January 1891, Cologne) was the German inventor of the first internal-combustion engine to efficiently burn fuel directly in a piston chamber. Although other internal combustion engines had been invented (e.g. by Étienne Lenoir) these were not based on four separate strokes. The concept of four strokes is likely to have been around at the time of Otto's invention but he was the first to make it practical. The Otto engine was designed as a stationary engine and in the action of the engine, the stroke is an upward or downward movement of a piston in a cylinder. 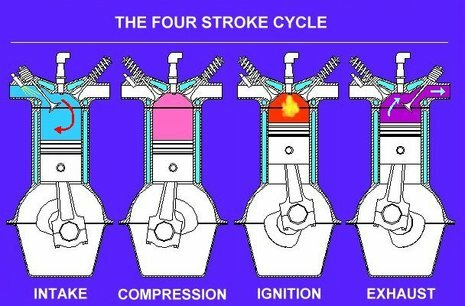 Used later in an adapted form as an automobile engine, four strokes are involved: (1) downward intake stroke—coal-gas and air enter the piston chamber, (2) upward compression stroke—the piston compresses the mixture, (3) downward power stroke—ignites the fuel mixture by electric spark, and (4) upward exhaust stroke—releases exhaust gas from the piston chamber. Otto only sold his engine as a stationary motor. Otto was the son of a farmer: his father also ran the local post office. He served an apprenticeship in commerce and following his apprenticeship worked as a business man in Frankfurt am Main and in Cologne. After relocating to Cologne he quit his office job in order to construct small gas engines, starting out by seeking to improve on the existing design of Étienne Lenoir. Otto married Anna Gossi and the couple produced seven recorded children. His son Gustav Otto grew up to become an aircraft builder.